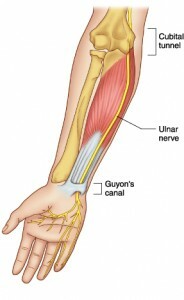 The ulnar nerve is a nerve that connects the hand with the spinal cord and brain. It is responsible for transmitting the sensation of touch from the little finger side of the hand and is the controller for some of the muscles in the hand and forearm. If this nerve is compressed at any point along its length this can result in symptoms of ulnar nerve compression. When the ulnar nerve is compressed the usual signals cannot get along the nerve. 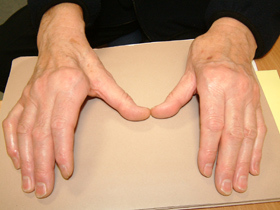 This leads to a feeling of numbness or “pins and needles” on the little finger side of the hand including the little and usually half of the ring finger. It can also lead to weakness in the fingers and grip and cause troubles with fine tasks such as picking up small objects and doing up buttons. When identified early symptoms can be helped by modifying activities to keep pressure off the nerve. Physiotherapy and occasionally the use of protective splints at night time can help relieve symptoms. In more advanced cases the treatment is surgical. Surgical intervention is designed to decompress the nerve at the site where it is being squashed. There are numerous sites along the nerve that it can be compressed. Your doctor will examine you and may ask for tests to be performed on the nerve. These tests known as “nerve conduction tests” help to localize the site of compression and direct the surgery to the right area of the nerve. The most common area of compression is just behind the elbow. If this is the site of compression then surgery involves a short general anaesthetic. An incision is made on the inside of the elbow over the nerve and the nerve freed from any compression. Depending on your particular circumstances the nerve may need to be shifted (transposed) in front of the elbow to prevent compression in the future. The procedure is done as day surgery and the hand can be used for light activities from the day following surgery. The arm is bandaged and remains so for 1 week. 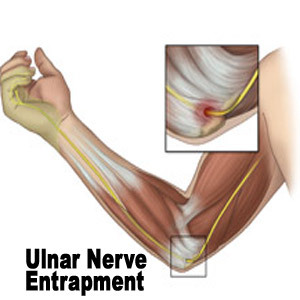 Recovery after ulnar nerve surgery depends very much on the degree of symptoms prior to surgery and the state of the nerve. The operative site will be healed within 10 to 14 days such that previous activities can be recommenced quite early. The recovery of the nerve and return of sensation and power to the hand depends on the state of your particular nerve and this will be discussed at your appointment with your surgeon.